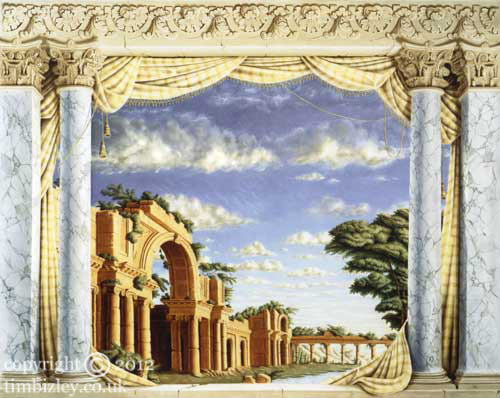 Muralists Neoclassical Painting of Marble Columns, fabric swags and Roman Ruins. This large mural painting of Roman ruins was commissioned to decorate the wall of a room designed in a contemporary Neoclassical manner. Murals can serve to support interior design schemes and add impact to otherwise uninspiring walls. The significant challenge as a muralist in this instance was to balance the light source illuminating the ruins which comes from within the picture, with the light source illuminating the foreground architecture which largely comes from within the room in which the work is situated. This is one of the challenges which meets the muralist and which sets apart the art of the muralist from that of the artist painting a picture designed to sit within a frame. This painting after Piranesi, was done primarily in transparent coloured oil glazes which in part accounts for some of the luminosity within the picture. Commissioning a muralist is similar to commissioning a painting and a competent muralist will be able to give design advice and general guidance as to what will work and look good in a particular location. Commissioned by private client. London UK.